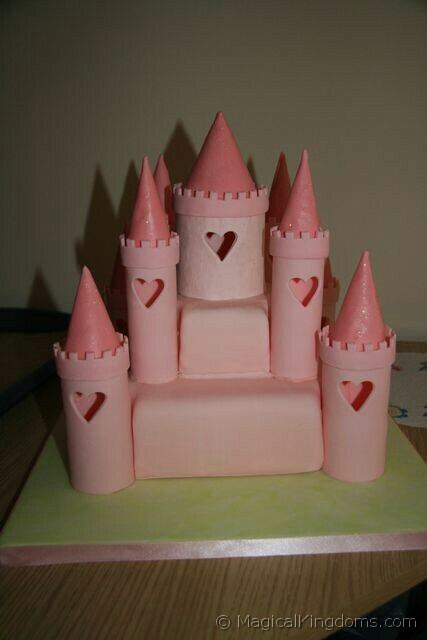 I made this Cinderella Coach cake for my daughter’s 4th birthday recently and thought I’d share with you how I made it. At least 2 days before assembling the cake you need to make the wheels as they need time to harden. 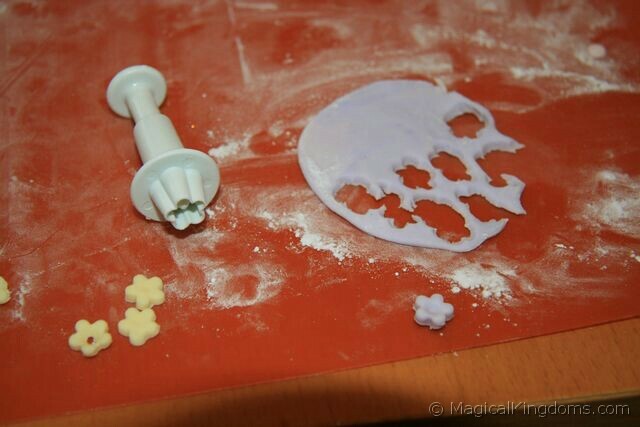 Get some white or ivory fondant (sugarpaste) and knead in gum tragacanth or CMC powder, according to instructions. Make sure it’s well mixed in. 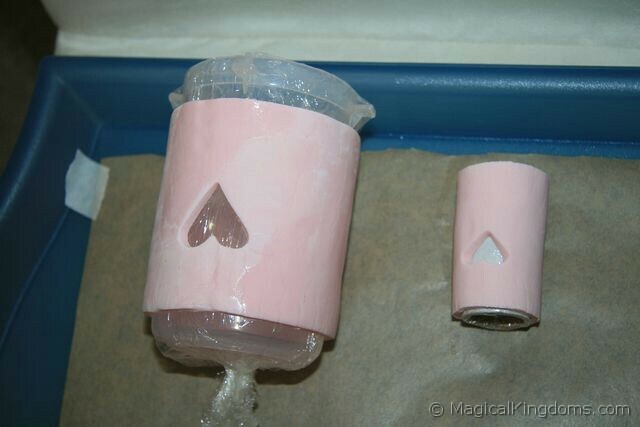 Wrap the fondant tightly in a sealed plastic bag and place in sealed container, ensuring no air can get to it. Leave for at least 8 hours if using gum tragacanth powder. Alternatively you can buy ready made modeling paste. Before starting I did a rough drawing of the coach, using the cake pan for the main coach circle. I then drew the wheels, door, etc. It’s best to use a sugarcraft gun (or clay extruder gun) to make long rolls for this part. If you don’t have one you can roll out long strips by hand, but it won’t be as even. 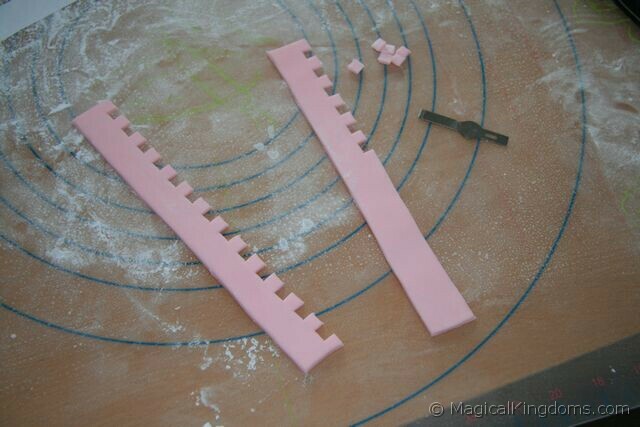 Use a large hole attachment in the extruder gun and push down to make long rolls of fondant. Place a piece of baking paper over the coach drawing so you can see through it. Work quickly before the fondant starts to go hard. 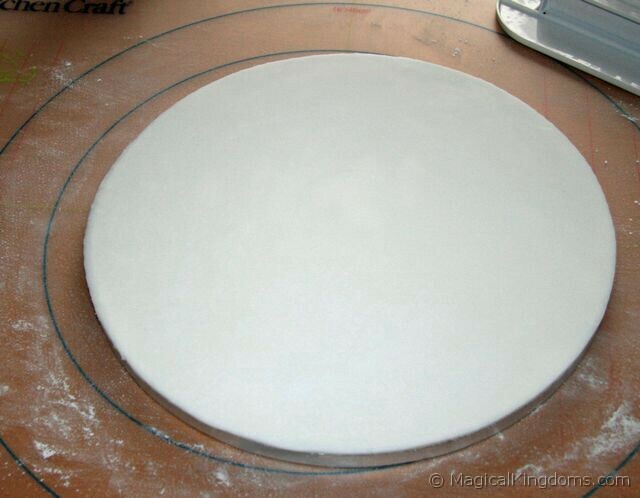 Wind the roll of fondant around to form the wheel shape. Do the other wheel then put aside to dry overnight. Repeat the process for the other coach parts – those that hold the wheels on, the side spirals and top spirals. Use a slightly smaller circle extruder gun attachment for the spirals. A few hours before assembling the cake, you need to attach the wheel supports to the wheels using a small amount of royal icing. At least a few hours before making the actual cake, cover the cake board in fondant and leave to go hard. 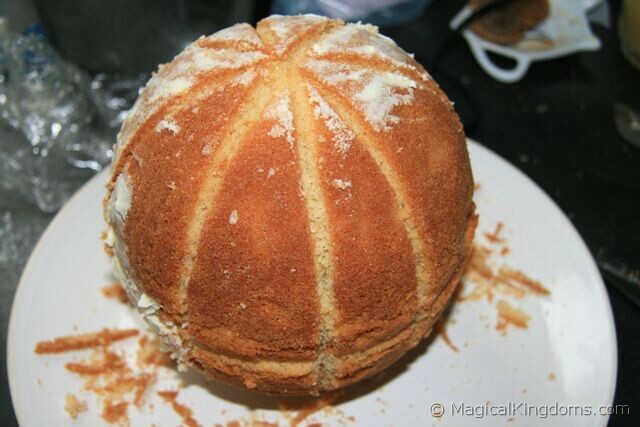 For the cake itself you need a ball shape, or two pudding bowls. I used the Wilton Sports Ball Pan Set. This comes as two halves which are cooked separately then sandwiched together with frosting. 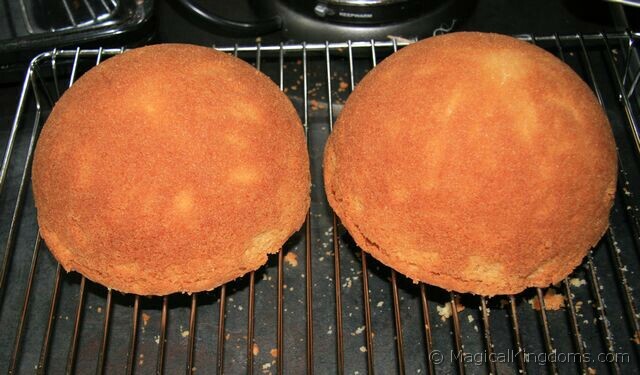 The recipe I used for the cake was the same as for an 8-inch round pan, and had a bit left over. Fill as near the top of each pan as possible, then when it’s cooked, slice the top off before removing the cake from the pan, then you’ll have a level surface. 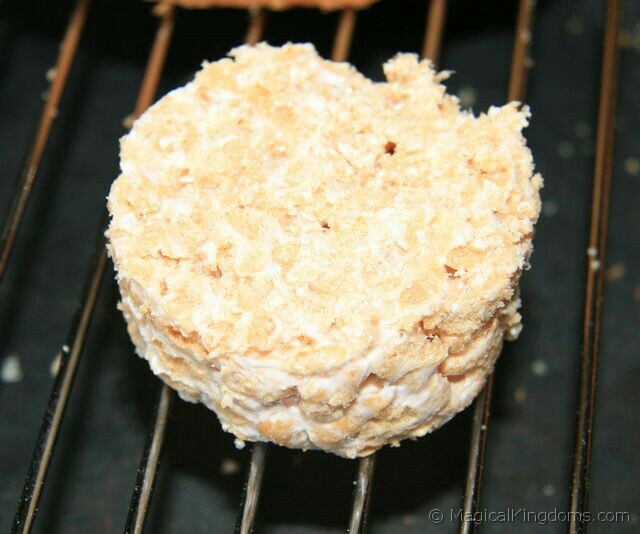 Once the cake has cooled and you’ve sandwiched together with frosting (buttercream), attach the Rice Krispie circle to the cake drum with a small amount of frosting, then place the cake on top using frosting again. 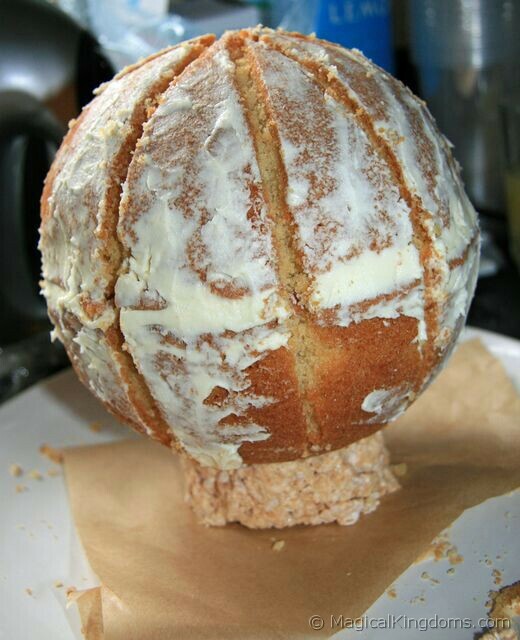 You then need to carefully carve out eight ridges at equal distance around the cake. 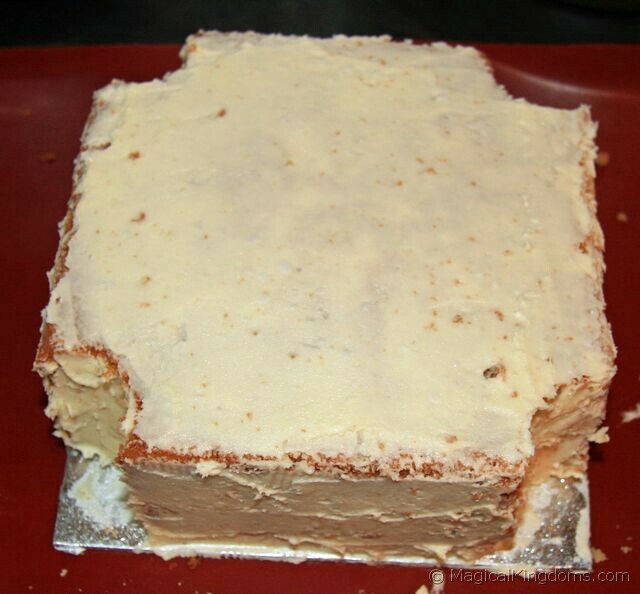 Next, cover the cake in frosting (buttercream) and refrigerate for around an hour, or until it has hardened. Take out of refrigerator and cover in another layer of frosting, this will help the fondant to stick to it. 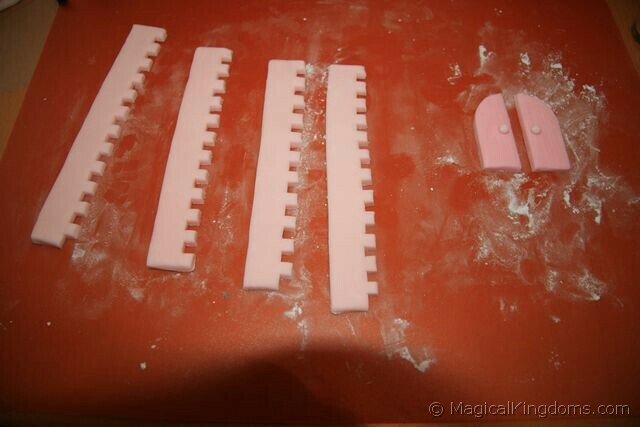 Color a quantity of fondant icing pale pink (I used a 454g pack and had some leftover). Roll out into a circle on a board, until big enough to cover the ball. 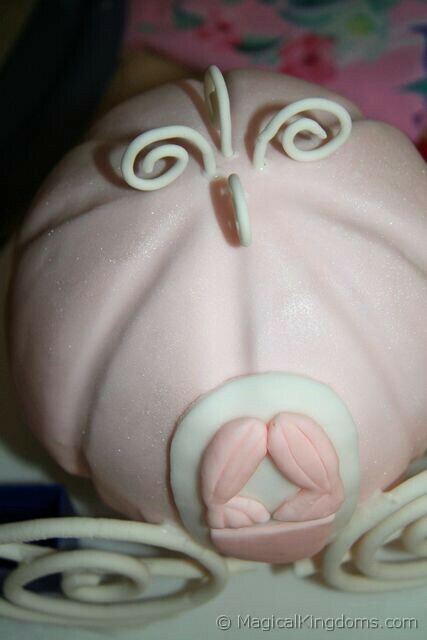 Carefully cover the ball, smoothing into the ridges to create the pumpkin effect. At this stage, you can dust edible lustre powder over the whole ball. If you wait until the icing has dried out it won’t stick. Now it’s time for the wheels to go on! 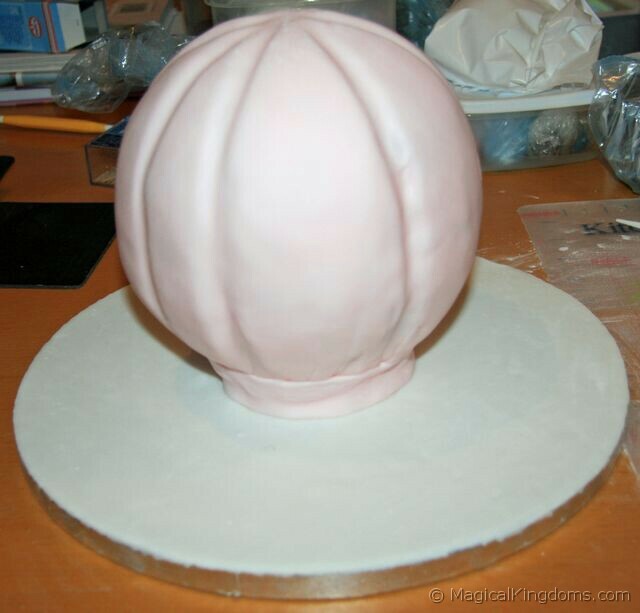 Using royal icing, attach the wheels to the ball and to the base. You’ll need to support them with something (I used small bottles and pots) until dried. 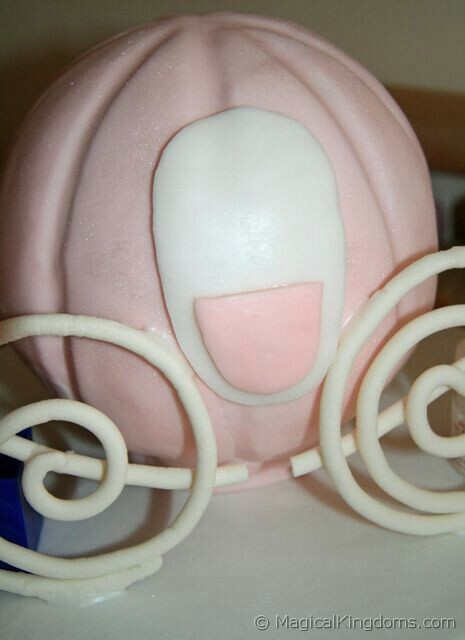 I only placed wheels at the front of the cake, but you can have them on both sides if you wish. 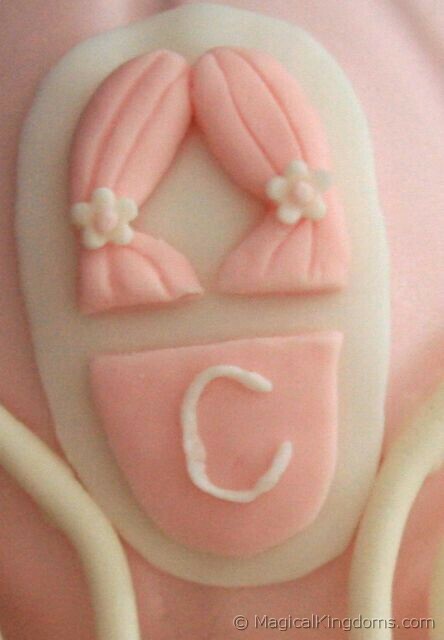 Cut an oval shape from white or ivory rolled fondant and attach to the front of the coach using royal icing or sugar glue. 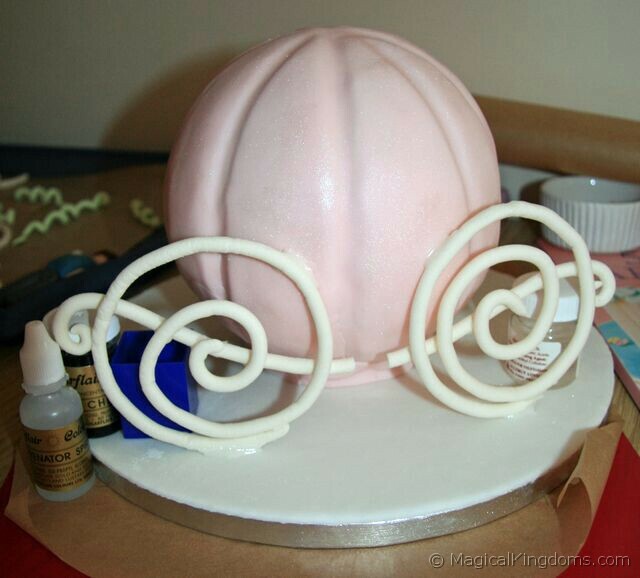 Then cut a smaller half oval out of baking paper, and use as a template to cut out pink rolled fondant to stick on for the bottom door. 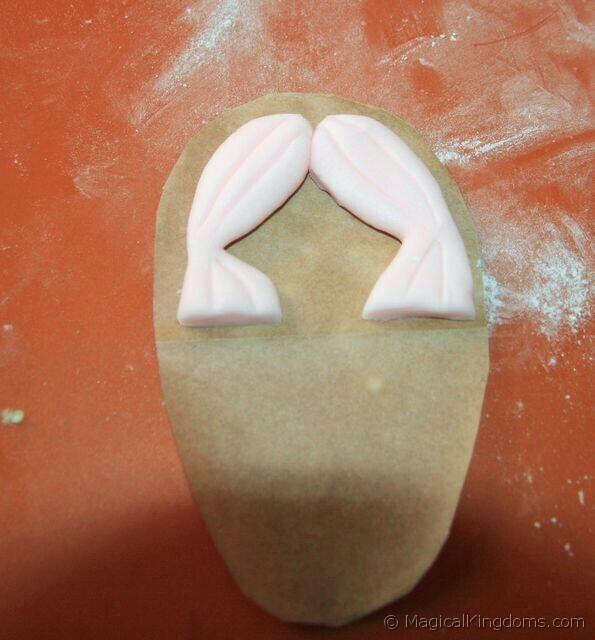 Using the template as a guide, cut and shape a pair of drapes (curtains) from pink rolled fondant. Draw lines on using a tool. 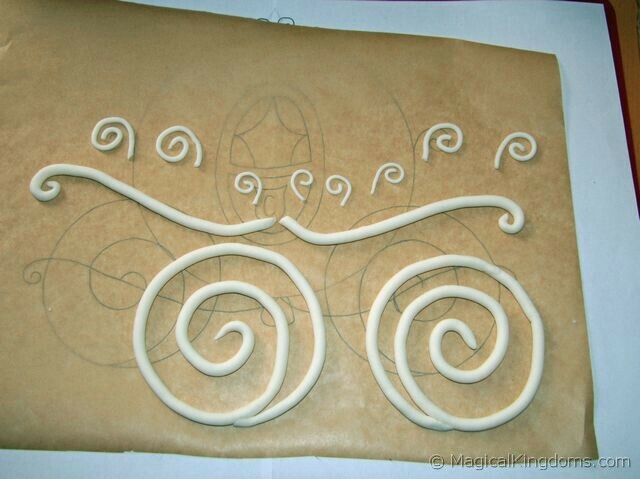 For the top spirals that you made a few days ago, poke four small holes in the top of the cake, and fix spirals into place using a small blob of royal icing. 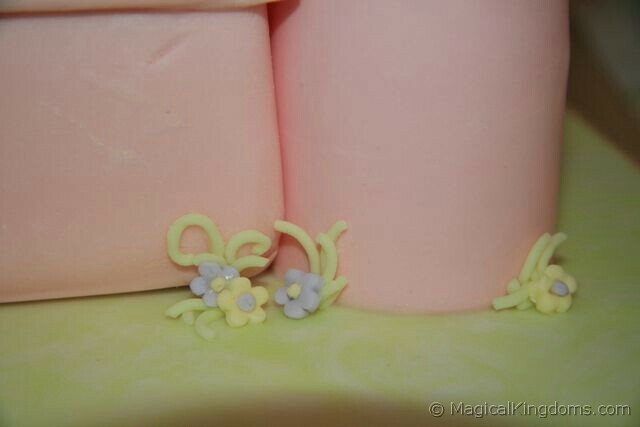 Cut two small flowers from white rolled fondant using a plunger cutter. 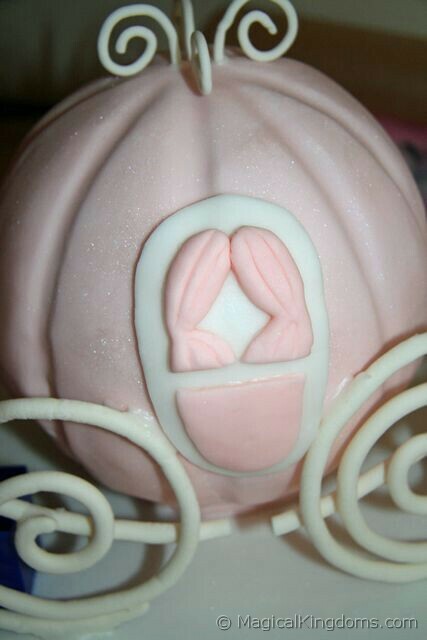 Stick to the drapes, and add a tiny squashed ball of pink fondant in the centers. 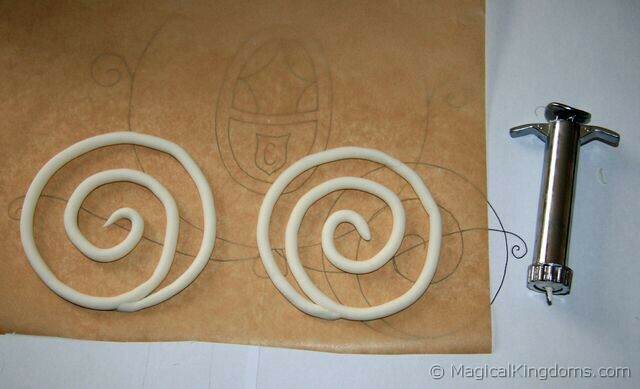 For the side spirals, again poke two holes in and secure them using royal icing. You will need to support until dried. I forgot to take a photo of making the glass slipper, but I made it from modeling paste (fondant + gum tragacanth) a few days in advance. Then I painted it with confectioner’s glaze and sprinkled lustre powder onto it. 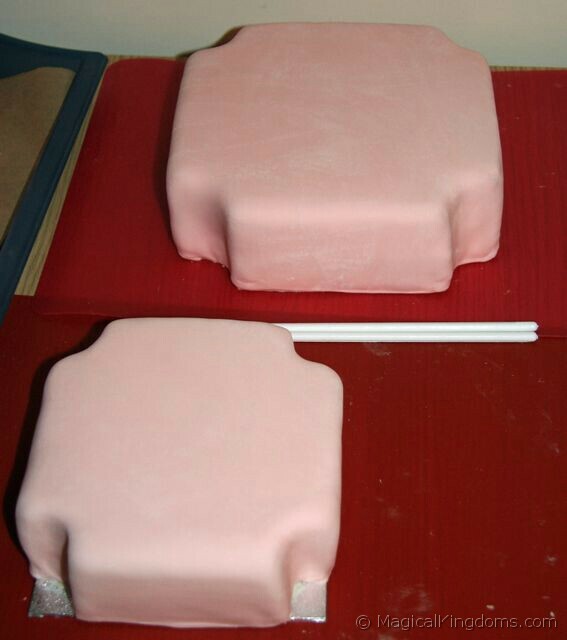 For the pillow, I simply shaped a square cushion shape, with rounded edges, from pink fondant. Rolled a long sausage of white fondant, which I attached around the edge, and used a tool to make diagonal indentations. For the tassels, I used the extruder gun with the multiple tiny holes disc, bunched them together and attached to each corner using a small amount of royal icing. To finish off the door, I piped a “C” onto it. 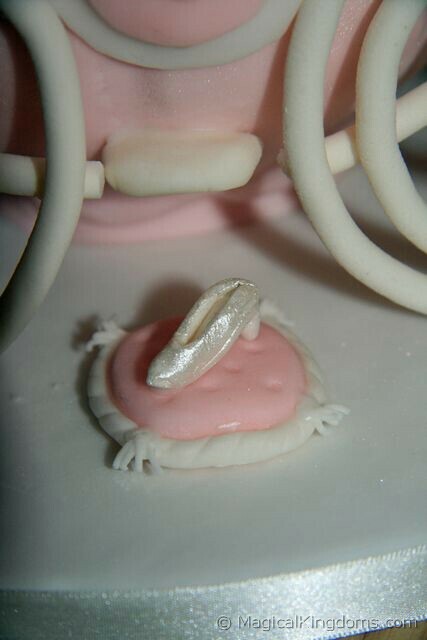 The step was made from a small rectangle of ivory rolled fondant. The glass slipper on the pillow was stuck down in front of the coach to finish it off. You can edge the cake drum with satin ribbon for a professional finish. 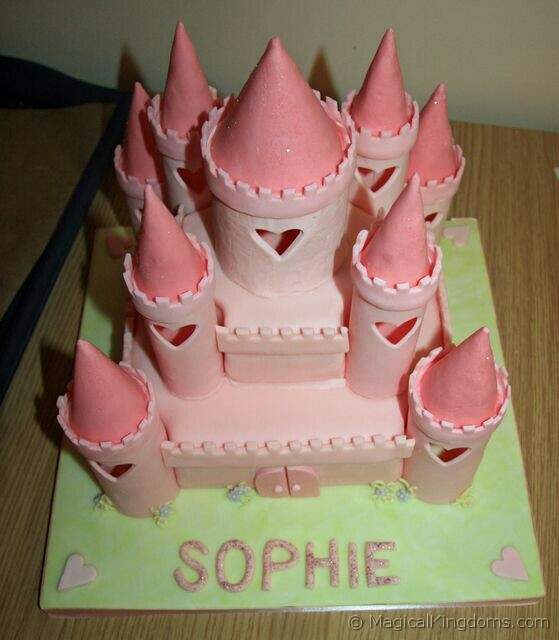 Here is my finished cake with my daughter’s name on, made from modeling paste coloured with silver powder. 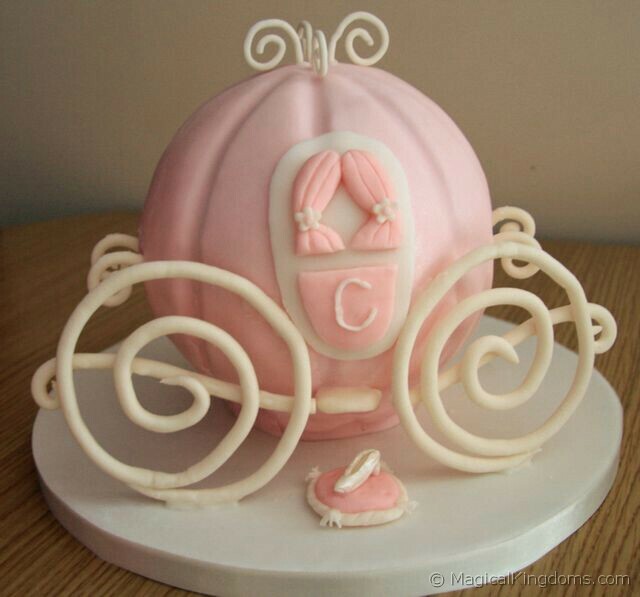 Here is a video guy showing how easy it is to make a Cinderella Carriage cake for a young girl’s birthday party. 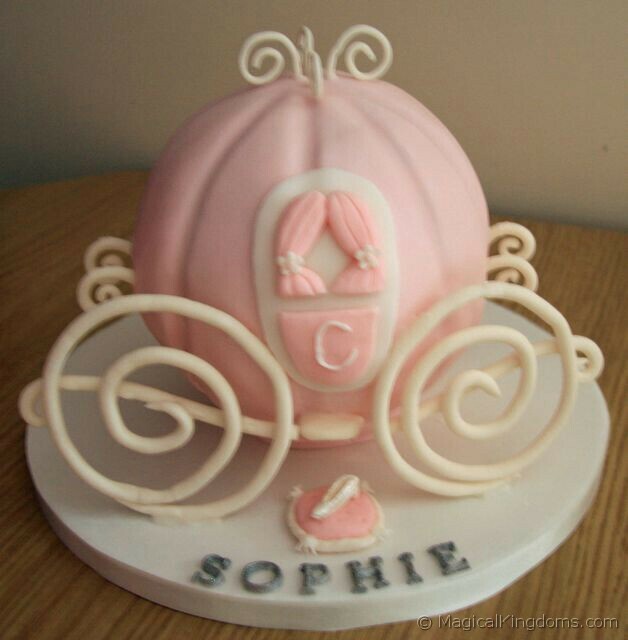 You may have seen my previous article on How to Make a Cinderella Coach Cake, which I made for my daughter’s birthday a couple of months back. 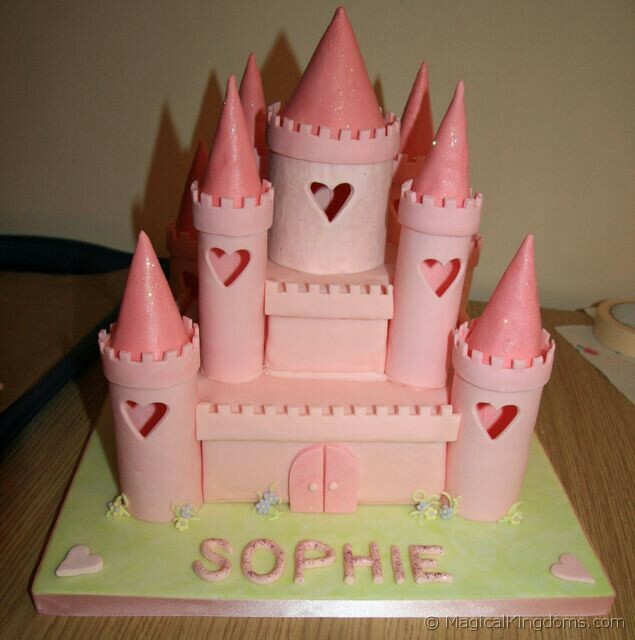 That was for her actual birthday, for her Disney Princess-themed birthday party I made this Castle cake. 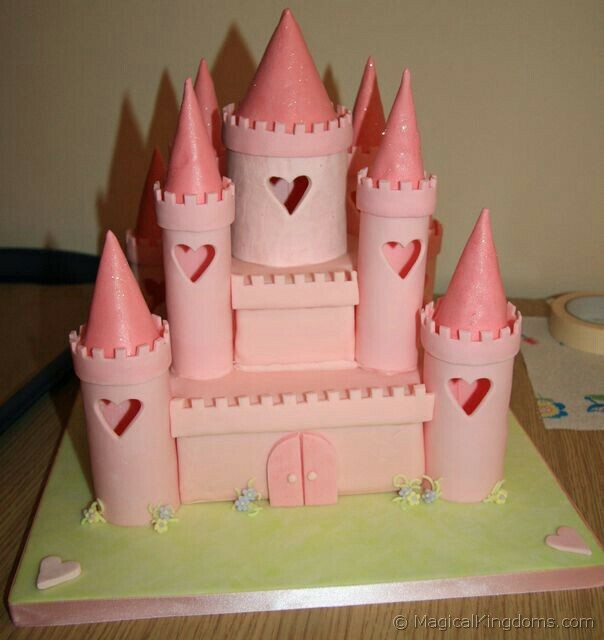 While it’s not strictly a Disney castle, it can be Disney-fied by adding some Princess figures, or Princess candles as I did. 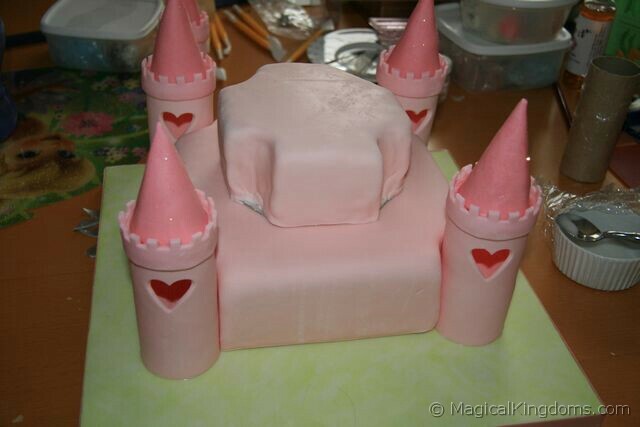 That’s right, come see how to make a disney princess cake! 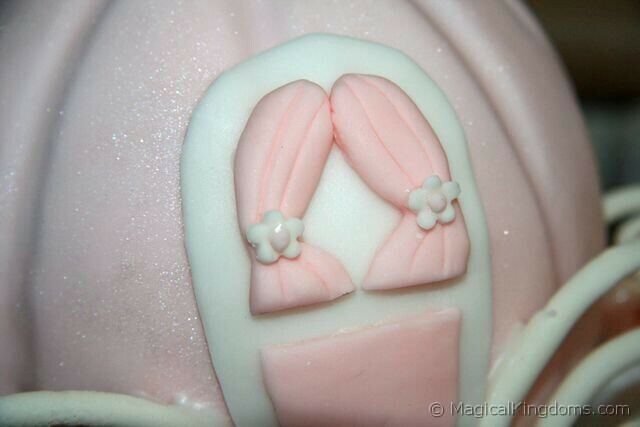 The Disney princess cake needs to be started a few days beforehand. To start with you need some cardboard tunes of different diameter. Four wider ones for the bottom turrets, four smaller ones for the middle turrets and a large one (I used a plastic food container) for the top turret. 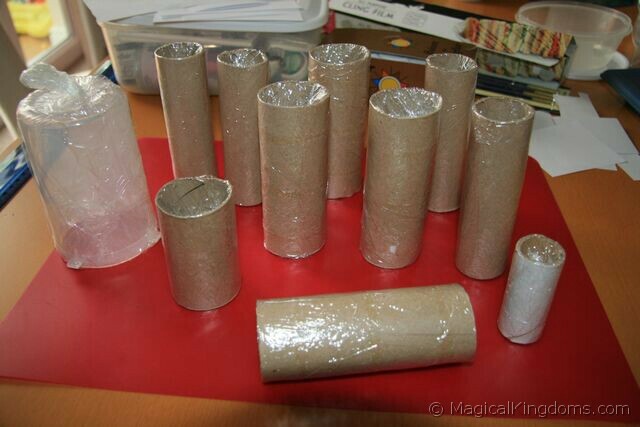 Cover the tubes with food wrap (cling film). For the icing you need either a good strong modeling paste or pastillage. 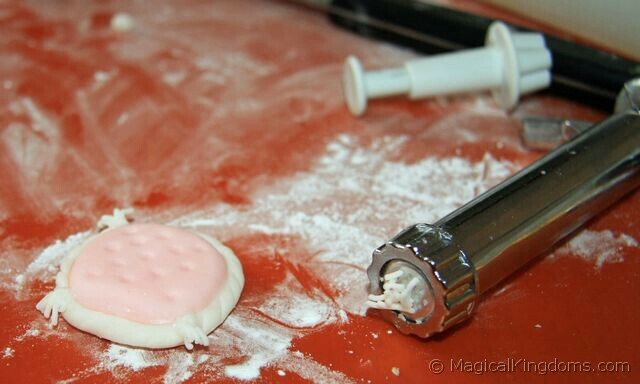 Pastillage is better as it’s very strong when dried, but is more expensive and as it dries so quickly you don’t have much time to work with it. To make modeling paste, get some white or ivory fondant (sugarpaste) and knead in gum tragacanth or CMC powder, according to instructions. Make sure it’s well mixed in. Wrap the fondant tightly in a sealed plastic bag and place in sealed container, ensuring no air can get to it. Leave for at least 8 hours if using gum tragacanth powder. Alternatively you can buy ready made modeling paste. I used around 1.25kg of icing for the turrets, but the amount needed can differ depending on your turret size and how thick you roll it out. 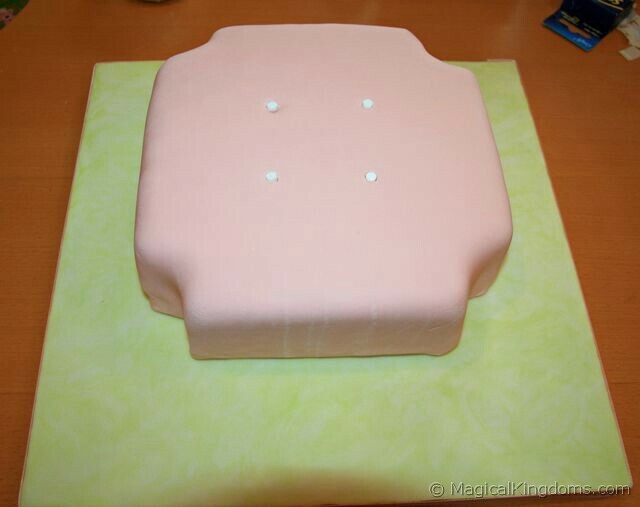 Color the paste or pastillage a pale pink colour using specialist icing colors. Roll it out to around 3mm thickness, and cut a rectangle to fit around the card tube. Prior to rolling out the icing, I cut templates from paper that fit exactly around each turret. I then used this paper template to cut the icing out. If you want heart-shaped windows in each turret, cut them out at this stage using a shaped cutter. 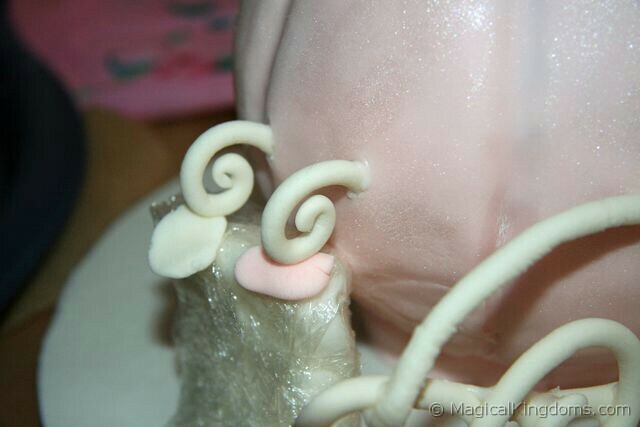 Wrap the piece of icing around the tube, and secure the edges together using royal icing or sugar glue. Lay them down on a sheet of non-stick baking paper, with the seam downwards, and leave to dry for a few hours. Once they’ve dried for a while, stand them up. After another few hours, or preferably overnight, remove the card tubes carefully from inside and leave the turrets to stand so they can dry out inside. 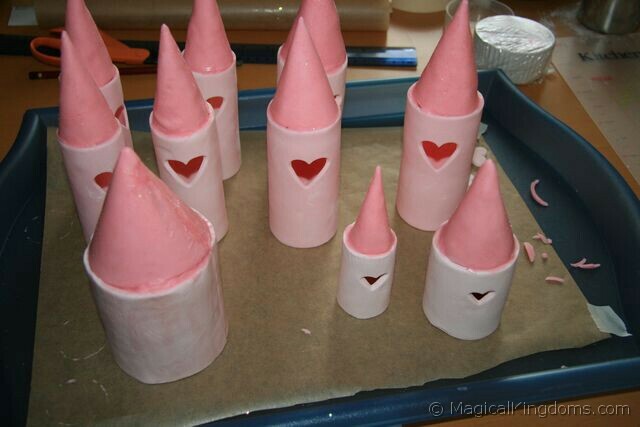 Next, you need to make the cone shapes to fit on top of the turrets. again, I cut paper templates first, and measured them to fit on top of the card tubes. It can take a bit of trial and error to get the right size of cone, so it’s better to use paper first rather than waste icing. I made cones from paper and covered with food wrap (cling film). 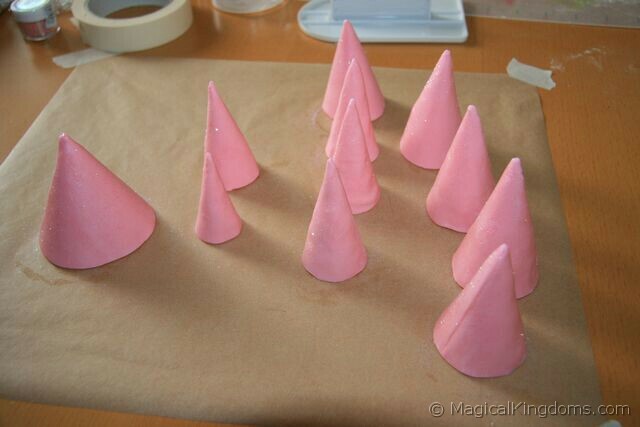 I coloured the modeling paste a deeper shade of pink, cut the shapes out using my paper cone templates, and shaped them around the covered cone shapes. Before the icing/paste dried out I painted the cones with edible glue and sprinkled edible sparkle dust over them. Leave to dry overnight, then carefully remove the paper cones inside, and leave so that the insides can dry out completely. 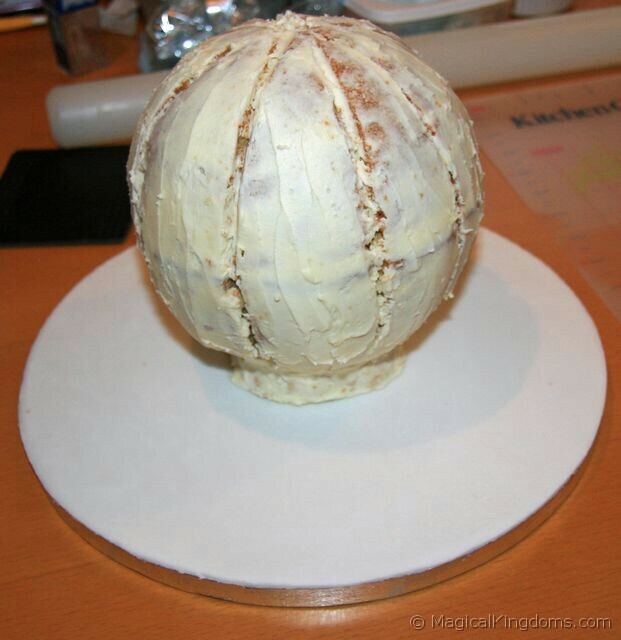 Meanwhile, cover a 13″ cake board with rolled fondant, and leave to dry. 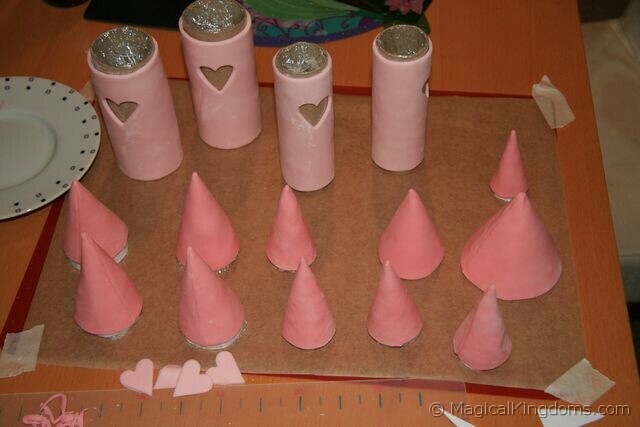 Once your turret parts are completely dry, attach the cones to the tubes using royal icing. 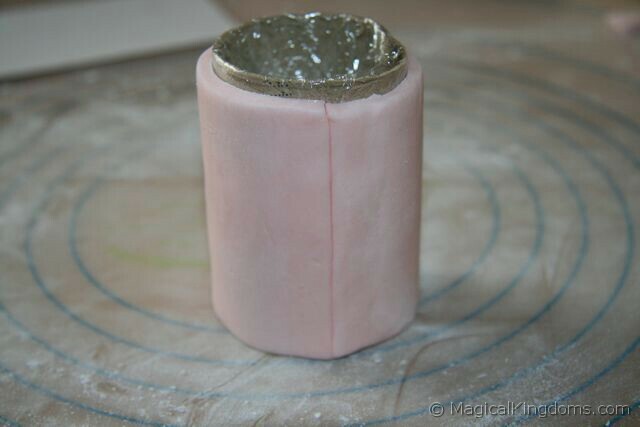 Fill in any large gaps around the edges with rolled fondant or modeling paste in matching colors. Next, you need to roll out some more modeling paste and cut into 2cm wide strips, long enough to fit around each turret. Once again, making a paper template helps. Cut out the squares using either a small square cutter or I used a small flat blade. 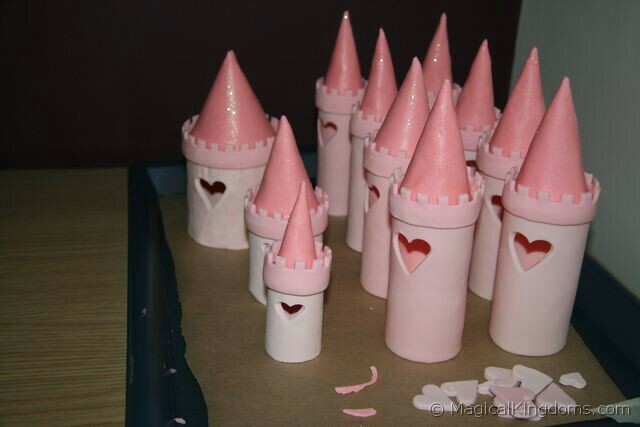 Attach the strips to the top of each turret using royal icing or sugar glue. You need to bake two cakes, either a 5″ and an 8″ square, or a 6″ and a 9″ square. 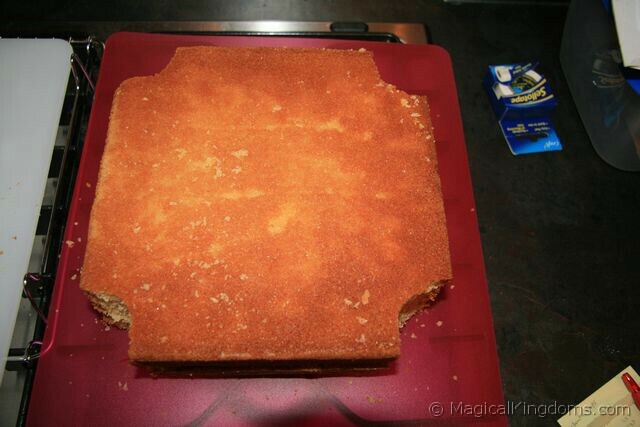 Once baked and cooled, get a circle cutter and cut out the corners of each cake. These are where the turrets will fit, so need to be big enough for them to slot in. Cover the cake with frosting (buttercream) and refrigerate for an hour. Then cover with another layer of frosting. 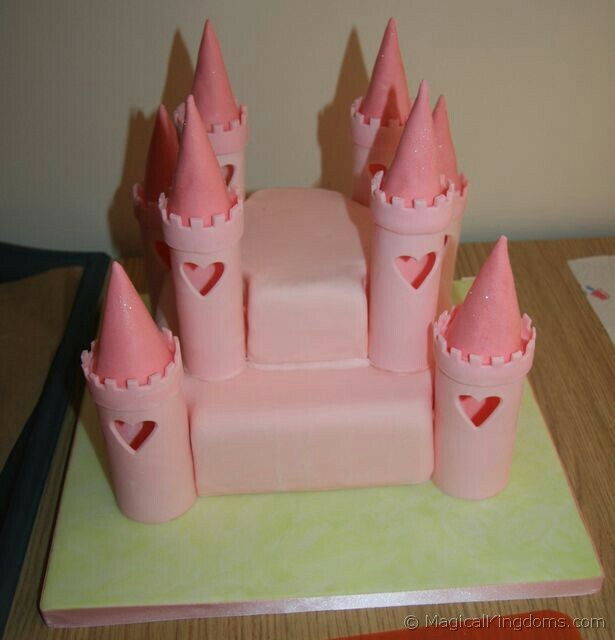 Cover the cakes with pink rolled fondant icing (sugarpaste), placing the smallest cake onto a square cake board of equal size. Remember the large cake board I covered with rolled fondant earlier? 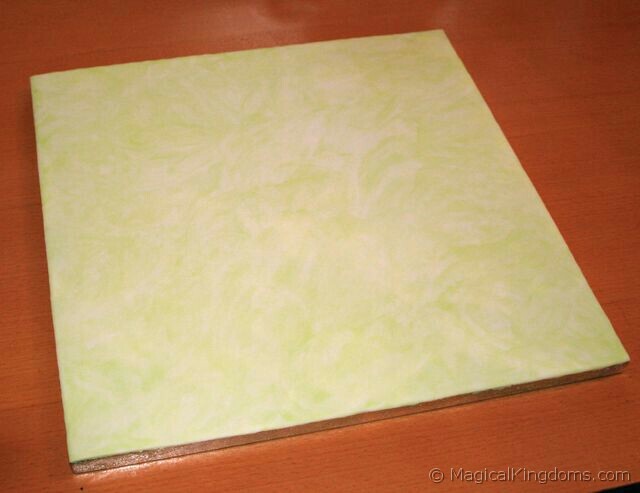 Once it was dry, I painted it with pale green coloring. Alternatively, you could have used pale green rolled fondant to cover the board. 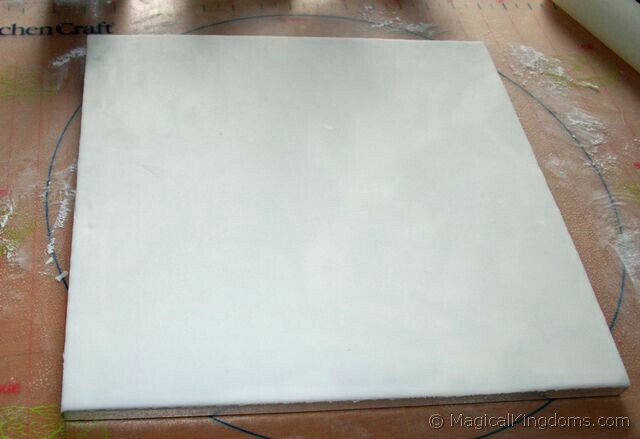 Place the largest cake onto this board, securing with a small amount of frosting or royal icing. Measure four pieces of cake doweling to size (stick into cake, mark it level with surface, and cut to size), and insert into center of cake as shown. This helps to support the top layer and prevents it sinking into the cake. Stick the top cake layer on, again securing with frosting or royal icing. 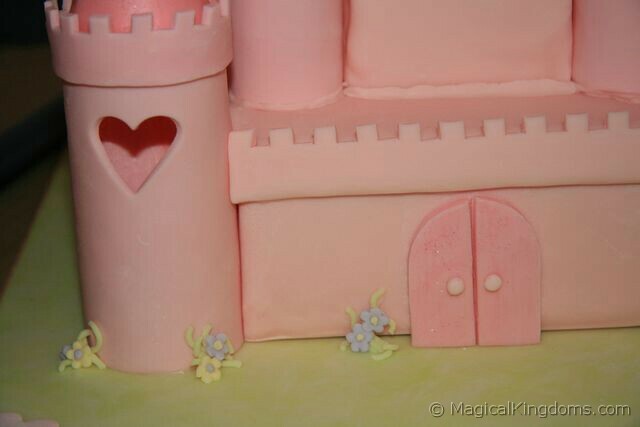 Attach the turrets, securing to the board and to the cake with royal icing. Attach a piece of pink ribbon around the edge of the board. Roll out some more modeling paste and cut 2cm strips. Measure the distance between the turrets on each side, and cut the strips’ length accordingly. Using the same technique as before, cut squares out along the edge. For the door, cut a paper template first, then use this to cut the two door halves from rolled out modeling paste. Roll two small balls and stick to the door for handles. Leave all to dry. 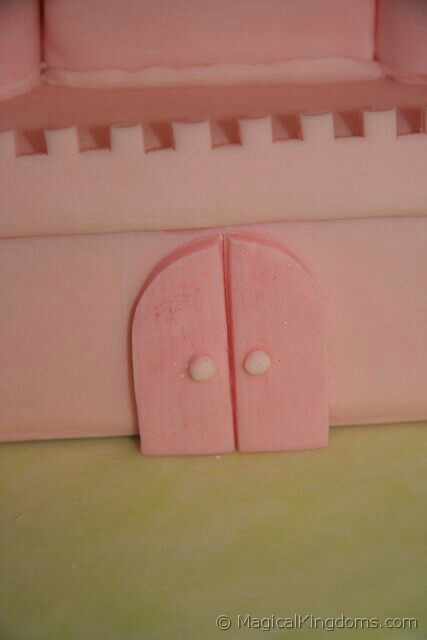 Once dry, attache to the castle using royal icing or sugar glue. Color some rolled fondant in co-ordinating pastel shades, and using a flower cutter, cut flower shapes from the fondant. Attach around the front of the castle. I made the green bits of grass/leaves using a sugarcraft gun and pale green rolled fondant. 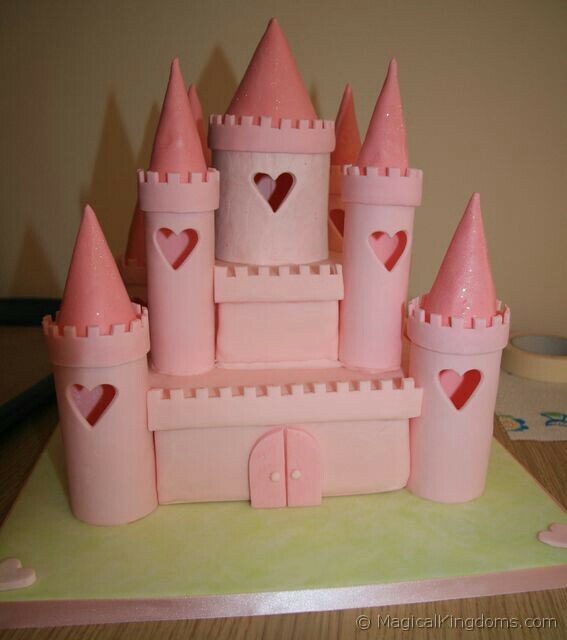 Also, check out this amazing video which is a Disney Castle Cake Tutorial : With Characters. Grand Floridian’s Room 4021 – The Best Room at Walt Disney World?